This day in 1956 saw the introduction of the first regular colour knitting patterns by the BBC - the British Bobble-Hat Corporation. Knitting patterns had already been widely available in black and white for some time, the restricted choice of wool available being due to the lack of coloured sheep. Over the years, many attempts had been made to colourise knitting, including hand painting and looking at sweaters through shaded filters, but the results were always unsatisfactory. 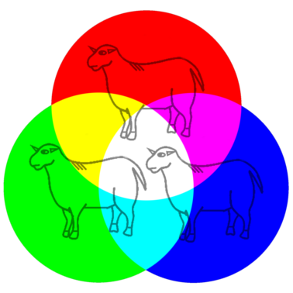 It wasn't until the thirties that a top team of research shepherds succeeded in breeding sheep in red, green and blue, producing wool that could be combined to create a broad palette of different colours. Using this technique, the BBC issued a limited number of low resolution colour patterns, but development was halted by the advent of war and the Corporation's facilities were turned over to the production of machine gun covers and tank cosies. But by the fifties technology had advanced considerably and regular distribution of colour patterns recommenced. Of course, like any new development, it had its critics. Some detractors said that it was unnatural and that knitting with different coloured wool would irreparably damage eyesight. At a rally in Manchester, the Right Reverend Josiah Flapps called it an abomination and said that every time someone knitted a coloured scarf the baby Jesus died. He urged his supporters to buy up coloured knitting patterns and bring them along to be burnt on a massive bonfire, and the sudden surge in sales was a huge boost to the fledgling industry. The meeting eventually broke up in disarray following ugly clashes with an Anti-Duvet demonstration in an adjacent field. Despite such scaremongering, coloured knitting was rapidly embraced by knitters all over the world and nowadays we take it for granted. And the technology has come on in leaps and bounds, meaning that you can buy patterns with more colours than ever before. One wonders what those old monochrome knitters would have made of today's widescreen cardigans and high definition mittens. Oh what an age we live in!